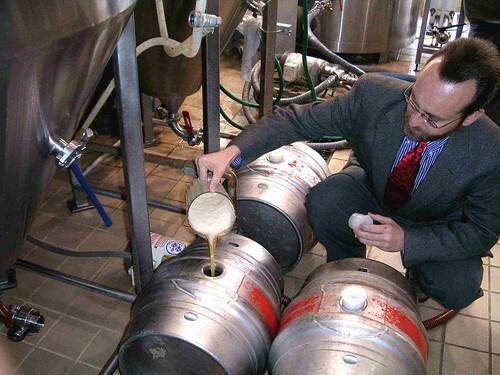 In February 2004, brewmaster Tom Flores invited YFGF's Thomas Cizauskas to add priming gyle* to freshly-racked firkins at Brewer's Alley, a brewpub in Frederick, Maryland. Now, that's a blast from the past. Now, that's some high hair. Now, that's some cellarman couture. That's a photo of me, from back in the day. I'm Thomas Cizauskas. 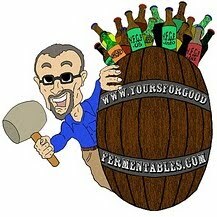 * When an ale has finished its fermentation, most of its CO2 will have vented off. The well-dressed cellarman will rack (transfer) this 'flat' ale into a firkin (10.8 U.S.-gallon cask). To this, he will add about a half-liter of freshly fermenting wort (pictured) —from a new gyle (batch) at high krausen (maximum yeast reproduction just before it begins to vigorously ferment). He may also add finings —clarifying agents— now or at a later time. Over the course of a few days, the resulting fermentation will produce about 1.2 to 1.4 volumes of CO2: just enough for an appropriately pleasant sparkle. 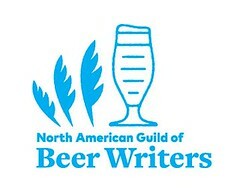 I've been told that this photo is being used by a brewing school for its class on brewing and preparing cask-conditioned ales. No need to have form suffer from function. Cask advice for 2017...from 1850. Pic(k) of the Week: Trumpeting, at Porchfest. Take Craft Back ... Alive!